You probably know that over 90% of all bad breath comes from the bacteria that live in our mouths. But you might not be aware that the “types” of bacteria from which these mouth odors originate are the most important part of the bad breath connection. Here’s 3 ways to win the bad breath war in your mouth and have a healthy balance of bacteria. The anaerobic bacteria are the ones that cause severe bad breath and gum disease. Since they can live without air, they are able to thrive amongst the tongue biofilm coating, under the gums, and in food traps in our mouth. In a healthy mouth, the aerobic bacteria can counteract the anaerobic bacteria. 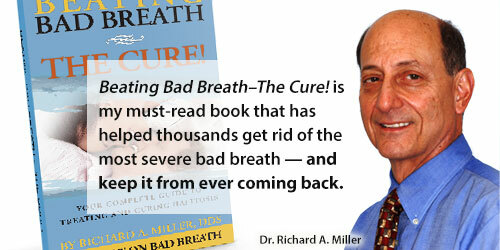 When there is a bacteria overload, the only way to eliminate bad breath is to get rid of the odor-causing bacteria. When this bacteria buildup is on the tongue, the treatment is called Tongue Rejuvenation. Tongue rejuvenation is a mechanical removal of the white-colored bacteria buildup on the tongue. Tongue rejuvenation restores the balance of the bacteria in the mouth. 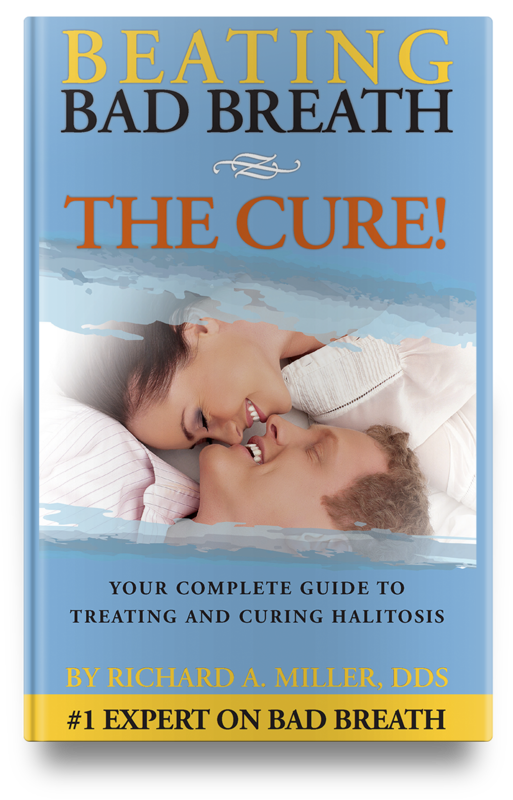 More Info: Read Dr. Miller’s blog article on Tongue Rejuvenation: Total Elimination of Bad Breath and Bad Breath Cure: Changing Lives for Halitosis Sufferers. When the conditions of the mouth support a balance between the two types of bacteria, there is no bad breath, no tooth decay, and no gum disease. In an article published in the Journal of Applied Oral Science, the authors state that “salivary pH tended to be acidic while tongue coating pH tended to be alkaline.” What this actually means is there is a war going on between the saliva in our mouths and the tongue coating, gum problems, food traps and the bacteria. In chronic bad breath or halitosis, the coating and its bacterial content are winning — creating the odors of bad breath and many times gum bleeding. This is accomplished with the tongue rejuvenation technique and gum treatment. Once bacteria balance has been achieved, our oxygen-rich saliva can take over this buffering process and begin killing bad bacteria and neutralizing odors. Unfortunately, once someone has a significant tongue and gum coating (biofilm), increasing oxygen in the saliva is too little, too late. This is why oxygenating mouthwashes only work in a limited way. Restoring the balance by eliminating the anaerobic bacteria and preventing them from returning changes the acid level to one that is favorable for the elimination of halitosis. That is why professional biofilm removal is necessary for a permanent cure. Because mouthwashes and tongue scraping only penetrate the top layers of a tongue coating and rarely get under the gums, most of the bacteria in the coating are still active and keep producing offensive bad breath odors. With Tongue Rejuvenation and gum treatment, the balance shifts away from an environment producing mouth odor to a balanced environment where no odor exists and gum disease and gum inflammation are eliminated. And, it can be maintained for life!